«Право на жизнь» — уникальное армянское издание (“Right to Live” – A Unique Armenian Edition). 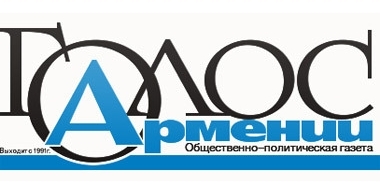 This is the title of the article published on October 23 in “Miasin” (“Together”) monthly of the Belarus Armenian Community. 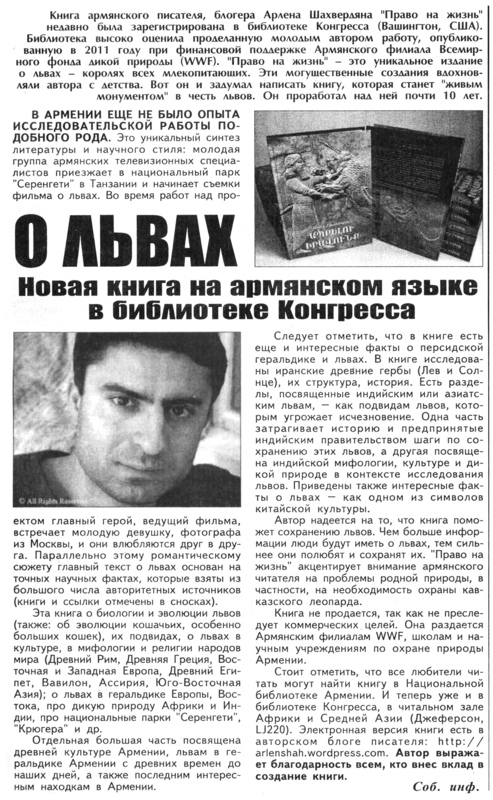 The article is about my book “Right to Live”. I much appreciate this publication and express my deepest gratitude to the Editorial Staff of the newspaper. You can find the article in the official website of “Miasin”. I’m honored to inform that the book is already well known in US as well as in some Eurasian countries. October 17, 2012 10:00 / 18 Comments on Մի՛ գրիր այս հասցեն, պարզապես հիշի՛ր այն / Don’t write this address, just remember it! – Oh, Johnny, you want to present something to me? What is that? Some collection of all-powerful knives “Nicer Dicer”, or advertising of a new training device? – No, Emily, this is a unique advertising, I would rather say – a sensational on!. I present to you Arlen Shahverdyan’s blog. Are you tired of your daily routine, daily problems? You want to be away from them? Are you bored and looking for new, creative ideas, new creative style? Not a problem! Here it is, your new friend – Arlen Shahverdyan’s blog? – Johnny, and how can I find this blog on the Internet? – Yes, dot, then write “wordpress”, and then add dot “.” once again. – Oh, my God! Again dot? How many dots! How interesting! – Yes, and in the end write “com”. So we got “arlenshah.wordpress.com”. – Oh, Johnny, that’s great! You are a miracle! I thank you, I will visit Arlen Shahverdyan’s blog right now. I’ll tell about this blog all my friends too. How grateful I am to you, John! – And I’ll get another Arlen for free? – Of course, no! 🙂 But you’ll learn about several creative news of the blog… But wait again as that’s not all. Visit the blog right now, and there you will get a very interesting and charming journey into the world of Author’s poems in Armenian as well as in English. Besides, you can find in the blog also all the published books by Arlen Shahverdyan as well as his posts and articles about Nature. – Oh, Johnny, how I thank you, I will visit this blog! – Visit definitely arlenshah.wordpress.com, visit it right now, Don’t write this address, just remember it: arlenshah.wordpress.com! P.S. Dear friends, I wrote and posted this humorous text (in Armenian) on April 27, 2011. It became one of the favourite posts of my blog. This post is for all those who love and appreciate good, healthy humor 🙂 I am glad that many people enjoyed this text. I wrote it on the basis of TV shop programmes. I appreciate the work of TV store and this is just good and harmless humor, which does not ridicule anyone as well as anyone’s work on TV store. At the same time, I hope that my blog has become so familiar to many and so loved in real life, that does not need any advertising, even such humorous. Just read this funny post. Hope you’ll like it. I wish you good mood and smile. Have a good day! I welcome all of you!